4 Seeds Energy Bar Recipe made using Chia Seeds, Flax Seeds, Pumpkin Seeds and Sunflower Seeds with Dates & Dry Fruits. You’ll never go back to store-bought after tasting these healthy and delicious 4 Seeds Energy Bars that are surprisingly easy to make. These Energy Bars are High Energy foods targeted at people who require quick energy. Energy bars are a convenient, on-the-go snack to toss in your gym bag. Roast all Dry Fruits and Seeds separately over low flame for 2 – 3 minutes. Switch off gas and roast Desiccated coconut on hot pan for 2 – 3 minutes. Grind Dates, roasted Dry Fruits, roasted Seeds and Raisins in food processor. Remove the mixture in a large bowl. Add roasted Seeds in that mixture and mix well. Take a Cake Tin and cover inside with aluminum foil. Shift Energy Bar mixture in tin and spread evenly. Keep in refrigerator for 1 & 1/2 hour. After 1 & 1/2 hour, remove Energy Bar cake from Tin and remove aluminum foil from it. Cut it into the desired size pieces. 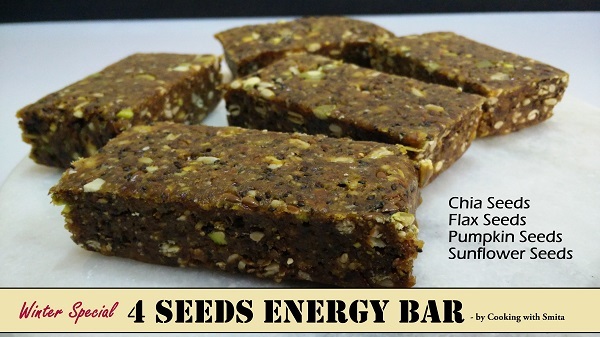 4 Seeds Energy Bar is Ready to Eat.